What is the most troubling skin problem for you? This is a skin renewal product with moisturizing properties to accelerate skin turnover, improving skin texture into a softer, more even tone by eliminating dull skin cells and stimulating new Epidermal Cells formation. Ingredients: Water/Aqua, Hydroxyethyl Urea, Hydroxyethylpiperazine Ethane Sulfonic Acid, Pentylene Glycol, Saccharomyces/Xylinum/Black Tea Ferment, Glycerin, Sodium Hyaluronate, Methylparaben, Phenoxyethanol.. Skin exfoliation is a key component to skin care that is often omitted by many people. By removing dead cells, new cells are formed in a uniformly stacked manner which looks much smoother and with a better tone (Please read "Basic Skin Care Tips" under Lavedo Treatment Website). Exfoliations can be done via Facial Scrubs, Acid Peels, Dermabrasions, or in this case skin care product. This is a mild exfoliation product with moisturizing properties. This product contains two main category of ingredients, for hydration and desquamation (removal of dead skin cells). Hydration ingredients include Hydroxyethyl Urea, Glycerin and Hyaluronic Acid, all of which are proven effective moisturizers, with Hydroxyethyl Urea being a newer ingredient in terms of invention with a better cosmetic 'feel'. 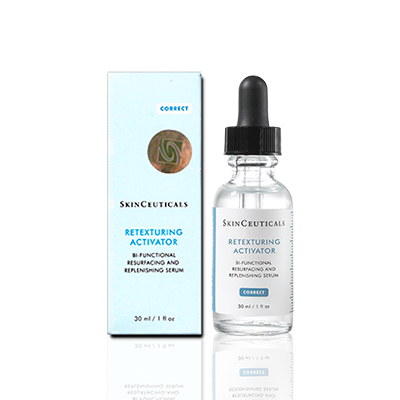 For skin cells renewal, it contains Sulfonic Acid, which is an effective cell renewal agent. However, anyone allergic to Sulphur should not use this product. If you are lazy in using facial scrubs, going for Fruit Acid peels, having light Dermabrasion done in beauty centers, then this is the product for you, which is better than doing nothing. A few drops on face and neck, each day, or if you are afraid of too much exfoliation, use it once every few days.